32 new freehold apartments ranging from 54 to 163 sqm offering a high degree of comfort and style are currently under construction at Streustraße 43. The internationally reputed Swiss architect Marc Kocher has created independent and unique building that blends harmoniously into the cityscape in this quiet part of the city. 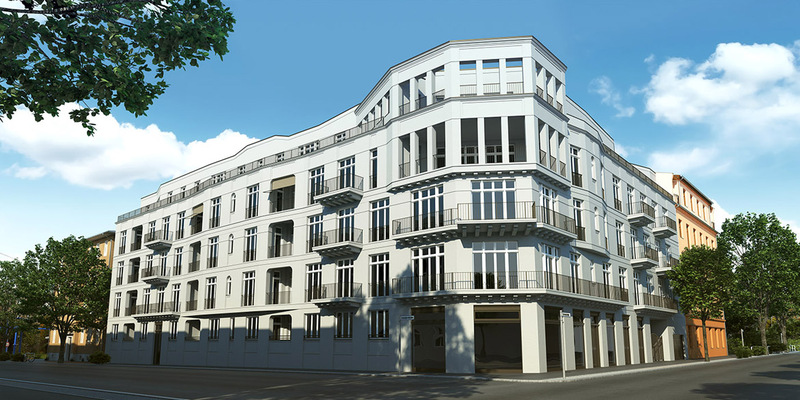 Commission-free sales will commence immediately and directly by the building owner via Bülow Immobilien GmbH. Weißensee is a very green area in the large Pankow district of Berlin founded in 1540 and is a great place to live. This mature neighbourhood offers childcare centres, schools, specialist shops, discounters, restaurants and pubs. In addition to historical buildings, also home to artists and creative people, as well as the Art School. Despite its city location, there are plenty of parks and places to relax, be it the ‘Park der Sinne (Park of senses)’ or its namesake the ‘Weißen See’ with its city beach. And the city centre is within easy reach by car or public transport. Unter den Linden 14 Min. Train station Friedrichstr. 20 Min. Motorway A10 „Ring“ 21 Min. The public transport is also excellent, e.g. you can reach the Alexanderplatz by the tram M4 or the Zionskirchplatz with the M12 in just 16 minutes. The new building is home to 32 freehold apartments that all have one thing in common: well-designed and optimised layouts that make the best of the available space. Bülow Immobilien GmbH has more than 15 years of experience with old and new build projects. A feel for the districts within Berlin and their individual characters combined with in-depth residential building planning and construction expertise are a guarantee for professional and personal customer service, as proven in many previous projects, for instance the „WohnQuartier Winsstraße“, „CASA ONDA“ of the „Palais KolleBelle“ as a co-initiator. Projects including the „Backfabrik“, the „Palais KolleBelle“, the „WohnQuartier Winsstraße“, the „Fellini-Residences“, the „CASA ONDA“ and the residential and office complex „Müller Martini“ and the „Villa Ball“ in Switzerland. All information presented reflects the current planning progress. Subject to modification. The product and company names used on this website are protected trade marks and may not be used without the explicit consent of the legal owner. The unauthorised use of protected trade marks will be prosecuted under civil and criminal law. All rights reserved. The design and content of this website are protected by copyright. All rights, also regarding the translation, reprinting of extracts and duplication of the design, the content of parts thereof are reserved. None of the contents of this website may be reproduced in any form or processed using electronic systems, copied or disseminated without the written permission of berlinovo. All text, images, graphics, data, etc. used on this website are protected by copyright law unless otherwise indicated. The re-distribution, alteration, commercial use or application in other websites or media is prohibited. The operator of this website takes the privacy of your data very seriously. We treat your personal information confidentially in compliance with statutory data protection regulations and this privacy statement. As a rule it is possible to use our web site without having to provide personal data. In cases where the pages of our website ask for personal data to be disclosed (e.g. name, address or email addresses), such data is always provided voluntarily as far as possible. This data will not be forwarded to third parties without your express permission. However, we have to advise that data transmission on the Internet (e.g. when communicating via email) always comes with a security risk. It is not possible to protect such data completely against access by third parties. Pursuant to § 7, Para. 1 of the German Telemedia Act (TMG), as a service provider we are responsible under general law for our own contents on this website. Pursuant to §§ 8 through 10 TMG however, we are not responsible as service providers to monitor transferred or stored information of third parties or to research circumstances that suggest an illegal activity. Obligations for the removal or barring of the use of information in accordance with legal regulations remain unaffected. Any liability in this respect is, however, only incurred from the moment that knowledge of the specific breach of law is obtained. As soon as the relevant breaches of law are known, the contents which are open to exertion of influence will be removed immediately. If you send us an enquiry via our contact form, we will only store the data provided on this form, including the contact data, to process your enquiry and to process any follow-up questions. We will not pass on this information without your express permission. We hereby expressly prohibit the use of the contact data published as part of our duty to publish an imprint for the purpose of sending us any advertising or informational materials that we have not expressly requested. The operator of this site expressly reserves the right to legal steps in the event of the unsolicited sending of advertisements, possibly via spam emails. Our offer contains links to external web pages of third parties, whose contents are not subject to our influence. Therefore we cannot assume responsibility for theses external contents. The respective supplier or operator of the sides is always responsible for the contents of the linked pages, hence, we expressly dissociate ourselves from all contents of all linked pages. The linked pages were checked at the time the link was established for possible legal infringements and recognizable legal violations. Unlawful contents were not recognisable at the time the link was established. Permanent checking of the contents of linked websites is however unreasonable without firm suspicion of any legal infringement. As soon as we become aware of a legal violation we will remove such contents immediately. The contents and the works created by the operator of the site are protected under German copyright law. Duplication, processing, dissemination or any form of commercialization of such material beyond the scope of the copyright law requires the prior written consent of its respective author or creator. These pages may only be downloaded and copied for private use, but not for commercial use. As far as the content of this page was not created by the publisher and/or operator of this website, the third party copyrights are respected. In particular the content of third parties is identified as such. Should you still have reason to believe that a copyright violation has occurred despite the precautionary measures taken, we kindly request that you inform us. As soon as we become aware of a legal violation we will remove such contents immediately.